When designing the canopy for any space, the first thing to decide is what sort of pattern should be used to fit the area, the décor, and the occasion the area will be used for. Tent – This pattern is usually used for more formal functions, such as a wedding, though it can be used for everyday enjoyment as well. 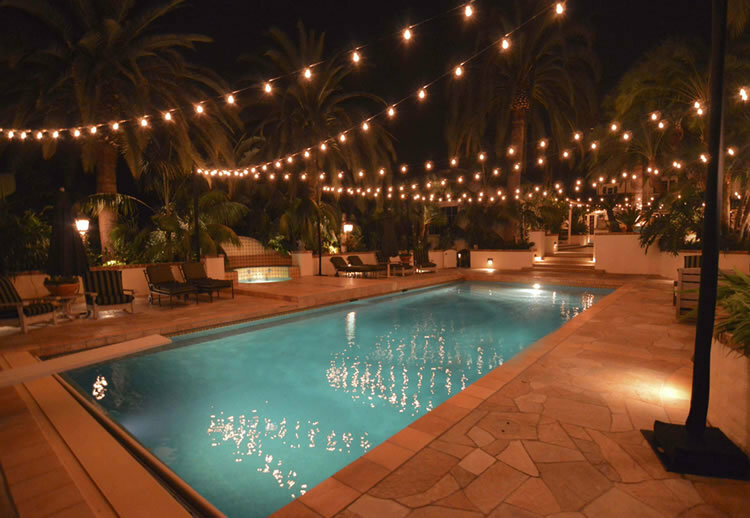 The string lights start on the outside in a square or rectangular-shaped area. They are strung evenly spaced on the outside, and meet in the center, to create the simulated tent roof. Scallop – This popular design has the string lights hung in rows, but scalloped to look like waves hanging from the beams, pinned at regular intervals, and swooping down in between. Zigzag – As the name suggests, this pattern has the light strings going back and forth diagonally along the length of area they are covering, illuminating a large space with only a few strands of light. Crossover X – This canopy can be used for a large square shaped area, using only a couple of light strings crossed at the middle to form an X. Or, if more lights are preferred, several X’s can be made by crossing more strands closer together, forming multiple diamond patterns. 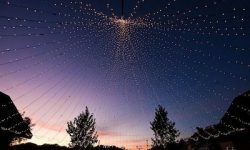 Square – This is a very simple design, completed by stringing the lights straight across both the length and width of the area to form a large grid-like canopy. 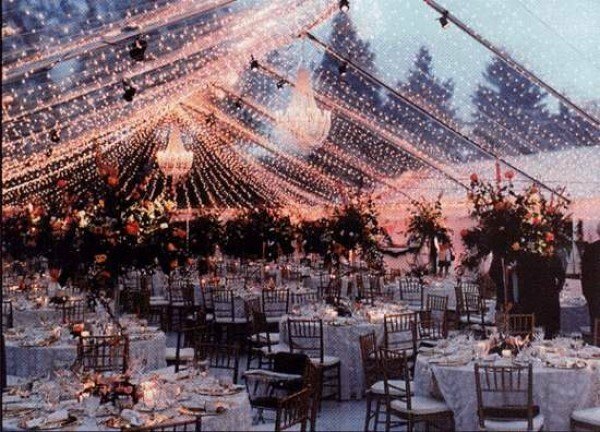 When planning a canopy, different patterns work best in different areas, and knowing which works best can make a wedding, backyard sitting area, or bedroom a space any designer would be proud to show off. 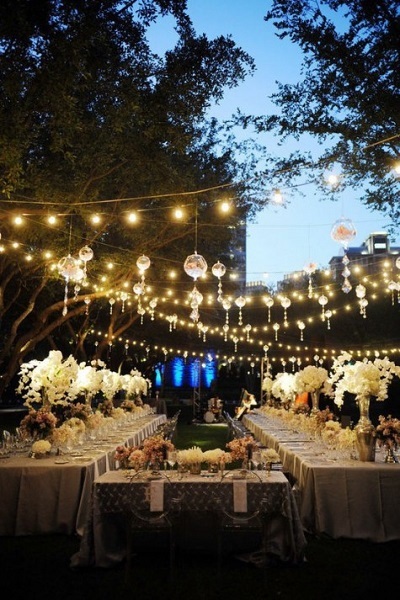 Wedding Canopies – For an outdoor wedding, the zigzag pattern would work perfectly over long rows of tables, bathing guests with the softness of small globe lights. 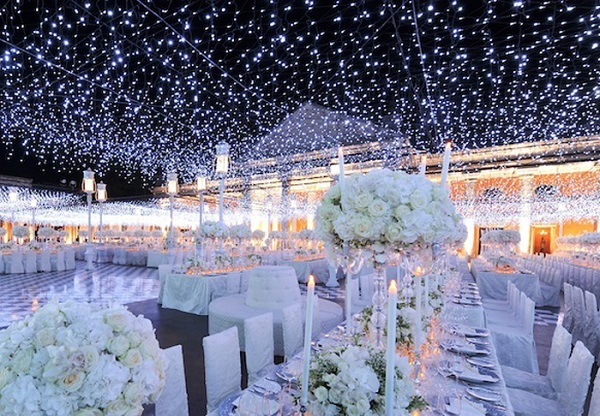 Another option is to create a tent of lights over the reception area. If using a real fabric tent, then string the globes inside to match the roof. This will not only supply the light needed to eat and dance by, but will also reflect off any shiny objects beneath, such as hanging decorations or wine glasses, creating a shimmering wonderland. Decks and Patios – By attaching flag brackets, or those of a similar size, to a deck or patio railing, and securing long poles or broom handles with them, the beginnings of a canopy support system is made. Hooks placed in the top end of the poles should be matched in position with hooks placed in outer house walls. 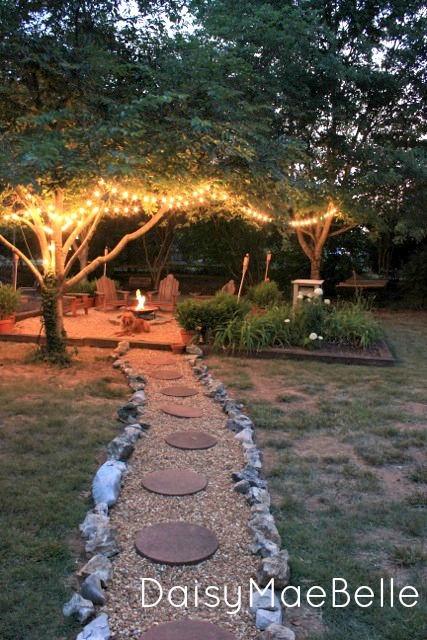 Globe string lights can then be strung in a zigzag or square pattern above. 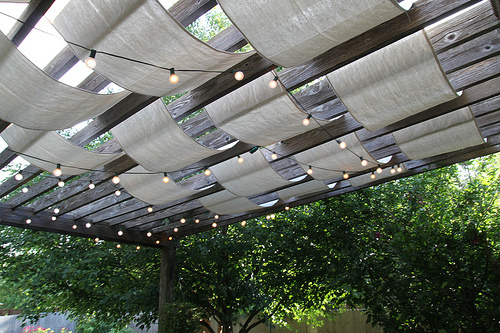 Pergola Canopy – Using a scallop pattern is the best way to create a globe light canopy in a pergola. Simply string the lights along the beams, to create a well-lit area to relax or dine in. Outdoor Fire Pit – If the area is surrounded by trees, a circular pattern around the perimeter, with a couple of X’s on the sides of the central fire pit, is the perfect canopy, brightening the area that the light of the flames may not reach. 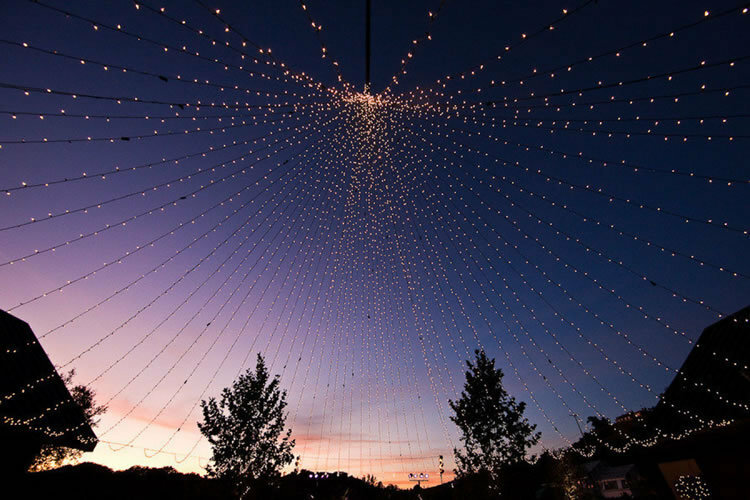 Outdoor Movie Theater – Zigzag a string of globe lights above an outdoor theatre, to give guests the light needed to move about as necessary, without distracting them from the movie before them. Pool Canopy – Square or zigzag patterns work well over an outdoor pool. The globe lights can be left off during the day, and plugged in at night to reflect off the pool like the stars in the sky. Bedroom Ideas – There are a few options for those with a canopy bed, depending on the style of each individual. If no fabric is used, the globe lights can be strung in a zigzag or square pattern across the top beams. If a fabric canopy is already above the bed, creating a tent pattern to match the pattern works best. 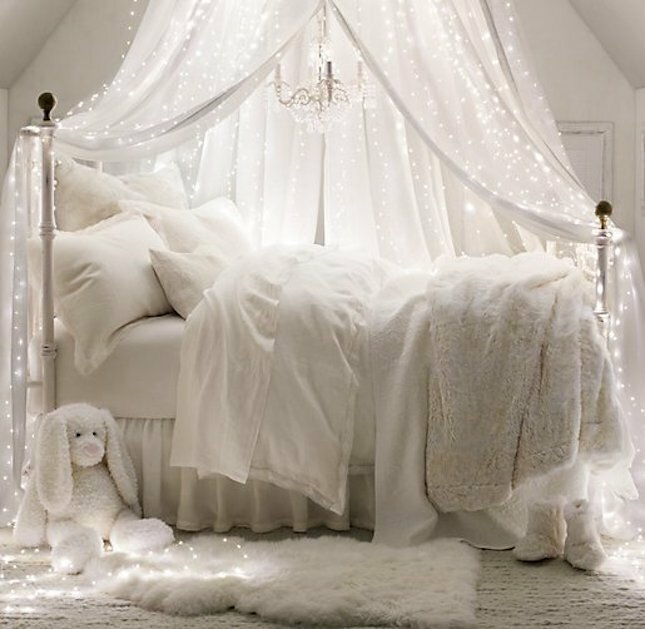 This can also be done with a bunk bed, hanging both fabric and globe lights over the top bunk, and draping both down and around the posts leading to the bottom bunk. Another option is to string the lights back and forth across the ceiling, to replace ceiling lights. This looks best with high ceilings or pitched roofs. Canopies of light create both interesting and gorgeous patterns, perfect for large gatherings or intimate dinners for two. With so many uses for those pretty strings of globe lights, there may not be any left for decorating when the holidays eventually arrive.